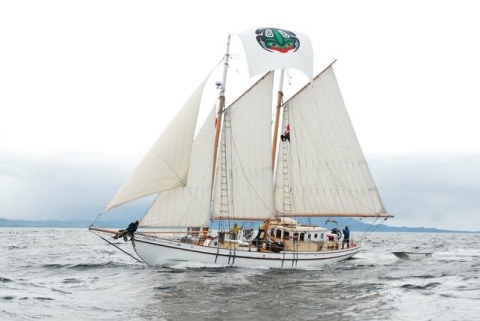 The Mycia is a hand-made, wooden, gaff-rigged, American sailing-fishing schooner, approx. 73 feet from bowsprit to stern. Sailing adventures, custom cruises, and excursions in the Pacific Northwest (Washington state and British Columbia) and Alaska are offered by exclusive arrangement with Captain John Maher, Melinda Trenary (his wife), and Captain Darcey Maher (one of their daughters). Schooner Mycia accommodates up to six guests and is family friendly. We invite you to learn more about us and the Schooner Mycia, read detailed information about our sailing adventures, make reservations, see our photo galleries, and sign-up for our mailing list. We're looking forward to sailing with you! Contact us to discuss the design of your custom sailing adventure. Create some of the best memories of your life aboard the Schooner Mycia!